Everybody's favorite cocktail party finger food, the Cheese Straw, is made even better with this quick and easy appetizer recipe. 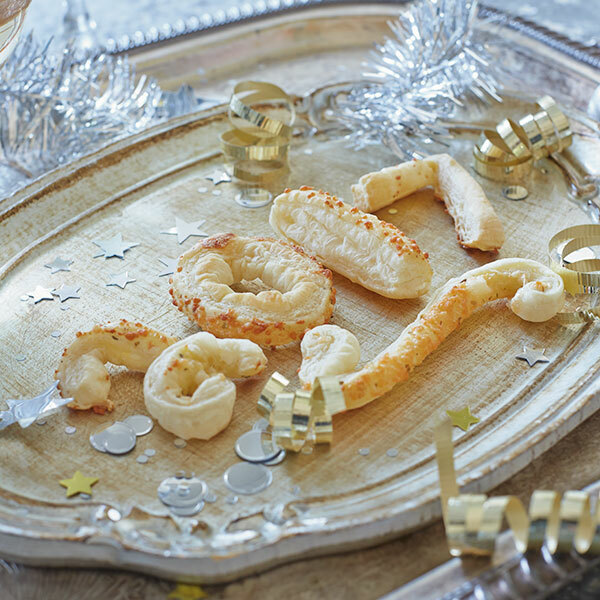 Whether you're serving these savory treats at a New Year's Eve party or a baby shower, just form the puff pastry into numbers or shapes for a fun thematic touch. Top with your favorite cheese and you have a delectable party snack. Unfold the defrosted sheet of pastry on a lightly floured surface. Beat egg with 1 tablespoon of water. Lightly brush ½ of the pastry with egg wash, and sprinkle it with kosher salt and ½ the shredded cheese. Fold the un-topped side of the pastry over the cheese and press together. Apply another layer of egg wash to the entire sheet of pastry. Then add the rest of the cheese and another sprinkling of salt. Cut the pastry into strips. On a baking sheet, twist strips into numerals. Bake according to package directions.